The countdown to the long holiday weekend has begun! In the world of alicia I countdown by wearing red, white, and/or blue with my favorite, nautical influence aka Week O’Nautical! Lets get this party started with mani Monday! 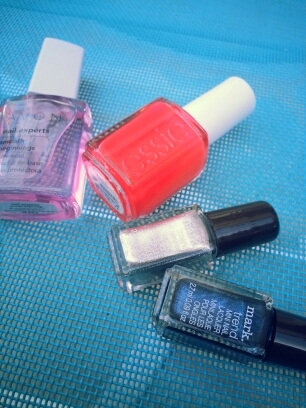 Left to right: Avon Smooth Beginings Base Coat, Essie Camera, mark. Tinseltown and mark. Blue Bella. Free-handing nail art doesn’t always look 100% awesome when you’re shaky but that’ll do pig, that’ll do. Check out my previous Week O’Nautical posts from years past to hype you up for what’s to come! Zoya Kristen for a Happy Birthday! Happy Birthday to my favorite Kristen today! In her honor I’m swatching Zoya’s Kristen. Ok Ok this may be part of her birthday present sooooo… sorry but I had to test it out! Zoya Kristen is part of Zoya’s Winter 2011 collection Feel, new neutrals. Zoya Nail Polish in Kristen can be best described as a gull gray nail polish with a mild bluish hue. An ideal cool neutral color that covers fully opaque in 2 coats. About Zoya Nail Polish – Zoya nail polish is an ultra long wearing toluene, formaldehyde, DBP and camphor free professional nail polish. Zoya is Vegan friendly and cruelty free. My ring is the Pretty Stellar ring from mark. available April 20th at my eboutique http://ahessinger.mymarkstore.com If you want it now hit me up and I can order you one. Its going to be a go to accessory all spring and summer long! Since my pic is so overexposed you can’t really tell how nicely it sparkles! Well, pre-St. Patrick’s Day nails… All week I’ve been sporting Essie’s Absolutely Shore with an accent nail of Essie Turquoise & Caicos. I told you its one of my ALL TIME favorite shades! Let’s just pretend that’s an Irish coffee in there, when really it’s a chai. I’ve really been obsessing over mint green so the pastel hue of Absolutely Shore has been perfect this week for my mood. And since it’s been raining all week its instant happiness! ps. sorry for the crappy image quality… mobile pics.